I have been pretty busy since the Holidays, packing up my house to rent, in anticipation of going on an extended adventure to France in the very near future...but that doesn't mean I don't have time to make bread! I always like to have some bread in the house and these day I making experimenting with Miche, Pointe-a-Calliere ala Shiao Ping. It is funny that the three times I have tried this recipe, the process has been less than text book....but in the end were very tasty! The first two times there were hydration problems... I opened up my new proofing chamber (see blog above) after 1 1/2 hours into the final proofing to find a puddle of dough stuck to the parchment paper. I scrapped it off, reshaped it twice,said a prayer and it honestly turned out to be an exceptional bread. Yesterday's bake did not go any easier! I thought I would use some of the water from the final dough and make a slurry of the stiff starter...so it would be easier to incorporate into the doughby hand. That was a bad idea...it turned out to be a real mess tiring to add it to the clay like dough by hand. By the time I had a good smooth, silky dough after many stretch and folds I was ready for a nap! But it survived the intensive care unit better than I did. When baked and cooled over night wrapped in linen, it was honestly the best tasting bread I have ever made. The whole Miche experience reminded me of something Max Poilane said in a book I am reading about breads and pastry shops in Paris.
" The best bread I ever tasted was one that didn't work....it fermented to long and it was full of holes like Gruyere. But, oh, what a taste. Bread unlike pasterine, is very forgiving. 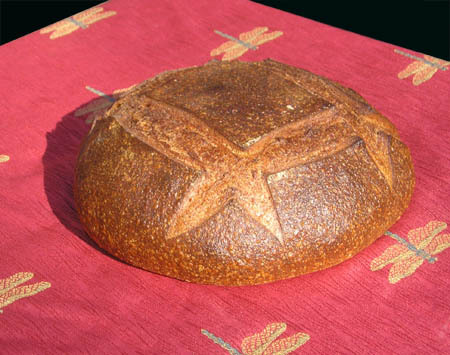 You can make mistakes and still end up with a bread that tastes good...."
Three cheers for the miche! And the couronne ain't too shappy, either. Thanks David...I have your San Joaquin sourdough in the on deck circle! 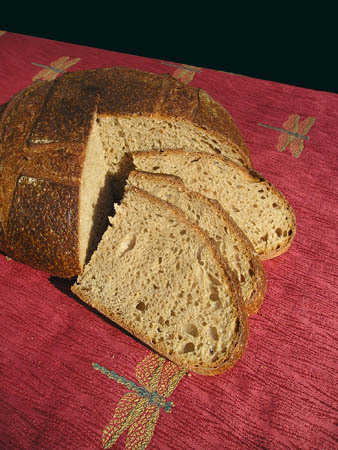 That crown looks great, my wife loves breads with nuts and fruits in them I think I should try making some wit semolina flour. Thank you for sharing it. I went over to check out your blog and will return to read more about your whole grain breads. My starter is in training on a whole grain diet and wants to try to run the triathlon! I must say...I really have oven envy! Who's design is it? The oven was build acording to Alan Scott book, and the facade was desighned by me I'm still waiting for some rock from our quary that I will decorate it with. Looks like it came out great despite all the stickiness. I know people have said it before, but some of my better loaves were ones that I had trouble with. But then again, I don't think I've ever made bread thinking I hadn't made any mistakes! Also, the semolina crown- yeah, I have made that like 5 times since I saw it on Susan's blog. I agree- it's a great (and addictive) recipe. Those are both nice looking breads. The apricot/hazelnut combination sounds interesting. The crumb of the apricot/hazelnut needs a little work..but i love a fruity bread...! I love pieces of apricots in bread. Nicely done. 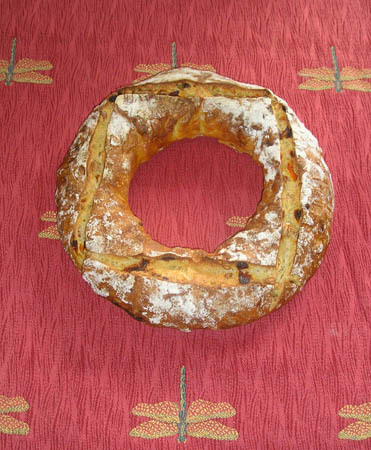 ...and the couronne came out looking terrific! I would have loved to taste the flavor of the miche. I really like the skinny shape you gave to your crown, not to mention the bits of apricots and the hazelnuts. Truly lovely!